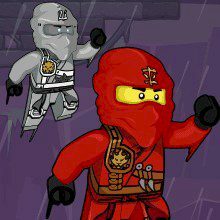 Pick your Ninjago hero and climb the walls. Get higher and collect coins, trying to dodge all traps and slippy surfaces. What will be your best score? Have you ever been to the mountains? It's both beautiful and exciting there. But there is a task for a tough ninja. Climb as high as possible using only your agility and ability to foresee troubles. Collect coins and secret scrolls, but dodge falling rocks, flying saws and many other dangerous things. How high you could possibly climb?